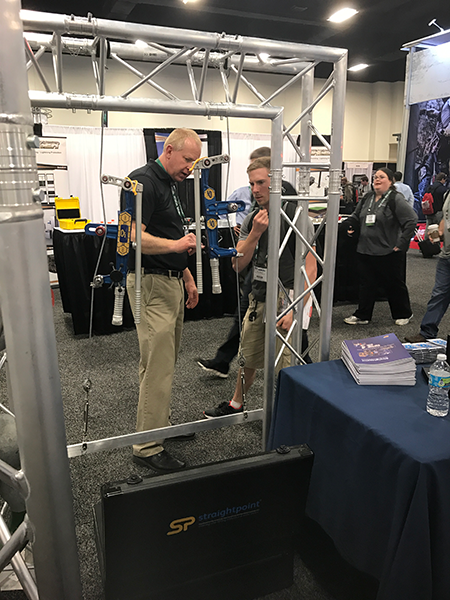 Mr. Loadlink comes back down to earth after scaling the heights of the recent National Association of Tower Erectors annual conference in Fort Worth, Texas. I closed my last blog with reference to our latest ‘groundbreaking innovation’, offering only a clue that it will be used for ‘measuring tension on static lines’, and kept you on tenterhooks by adding, ‘watch this space’ before signing off and disappearing knowingly into the sunset. The Clamp On Line Tensionmeter (COLT) boasts a state-of-the-art Bluetooth load monitoring app among a myriad of standout features. I wasn’t really trying to create the same effect as the novelist of a good old-fashioned page-turner; I’m a humble blogger. 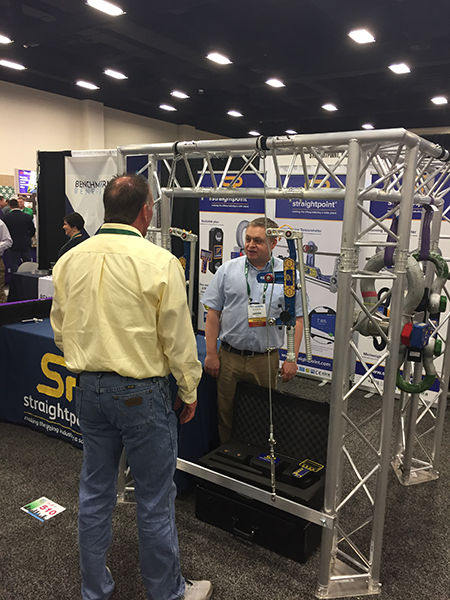 I was merely honouring a commitment we made to stage the official launch of the Clamp On Line Tensionmeter (COLT) at the National Association of Tower Erectors (NATE) annual conference, which straddled the end of February and the beginning of March in Fort Worth, Texas. As the show proved, there was no need for added theatrics. The reaction from the tower erection, maintenance and service professionals in attendance was overwhelming. I’d go as far as to say it was the most emphatic response I have seen for a new product in nearly three decades of attending trade shows and exhibitions. I’m glad it was kept under wraps, as the engaged, positive, quality demographic that NATE attracted to the convention deserved the first look. 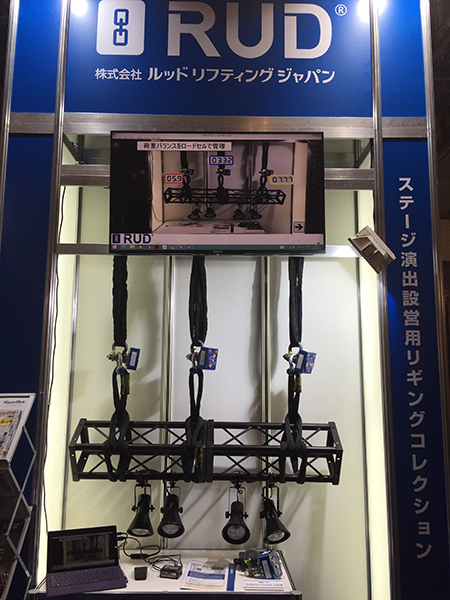 Of course, many pointed to the state-of-the-art Bluetooth load monitoring app, while the integral quick adjustment mechanism (meaning it can be used to measure wire rope diameters from 3/16 in. to 1 in. or 5mm to 25mm) was the standout feature for others. Both elements equally impressed one of the early visitors to the exhibit, from the tower erection sector. “So I won’t need additional sheaves or tooling and the app will contain details of infinite wire ropes,” he remarked. “Wow!” he added. It wasn’t the only time we heard that word. If the constant flow of footfall had abated I would have sat down to catch my breath. Reality was, no sooner had one inquisitive tower maintenance team left the stand (or booth as they call an exhibit stateside) a service company arrived, followed by another tower erector. At times, people had to leave the back of the crowd and come back later. Our product range is generally well received but this was unprecedented. 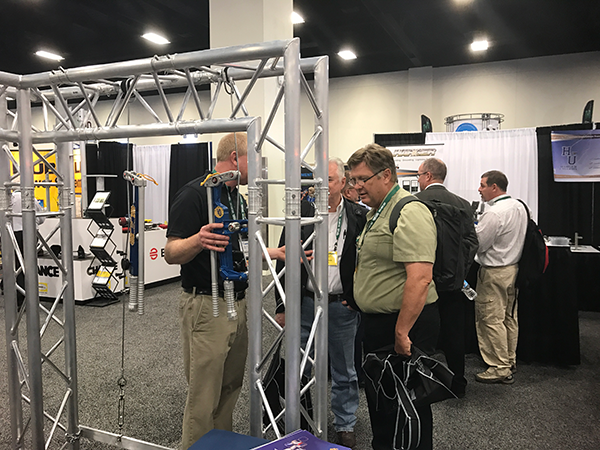 Tower erection and maintenance professionals were among visitors to our exhibit at NATE’s recent conference and exhibition. This blog isn’t about basking in our glory. The more important takeaway is the importance of tailoring a product to a marketplace and launching it in their back yard. Not everyone in the below-the-hook or, more specifically, force measurement industry knows what ‘plumb and tension’ means. To the NATE community, that’s their world. It’s a way of life. It was the perfect audience for the COLT, hence our endeavours to keep it behind closed doors until the event. Welcoming another NATE attendee to the Straightpoint exhibit. As I said in the press release we circulated as NATE doors flew open, we based the COLT on feedback from end users. Combining industry intelligence with our own research and engineering expertise, we devised a product that fills a gap in the market and supersedes alternative solutions. Further, it raises the bar in tension measuring technology to the stratosphere. The towers themselves are getting pretty high too. Many of the professionals we met frequently service structures that are hundreds of feet in the air and I heard references to 1,000-foot-high structures, as the communication network achieves coverage across the vast landscapes of North America. Imagine how important it is therefore that when there are, say, 12 guy ropes around a tower, the tension is equal. In this business, it’s no good being a few degrees off vertical. That’s where the COLT comes in. The computer numerical control (CNC) machined aluminium construction with high precision roller bearing pivot; high leverage tensioning arm; auto-locking magnetic handle mechanism for security when installed; and IP67 / NEMA6 waterproofing rating, will all combine as the tensionmeter is applied to keep this fascinating sector working efficiently and safely. (The COLT will typically be applied from ground level or using a stepladder to attach it two feet from a termination or connection). 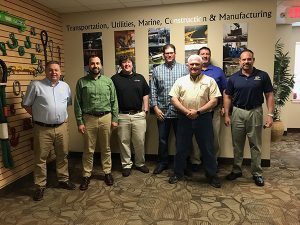 Wayne Wille, technical sales manager, has walked the corridors of NATE for a number of years. 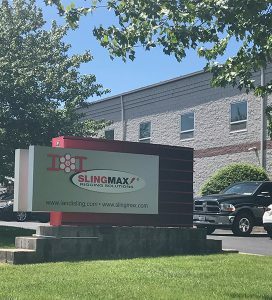 He’s a trusted authority in tension measurement and served as a great product champion for us after he joined the company during the latter stages of the COLT’s development. It was tremendous to have him on the stand throughout the show. Therein lies another important reminder: becoming a thought leader and commentator on a sector builds up incredible trust in a marketplace. It’s not as crude as this, and I paraphrase, but one delegate suggested, “If this product is as good as you say it is, Wayne, we want to buy it”. Another said, simply, “Wow! That looks awesome”, after exchanging pleasantries with their old friend and looking across to the COLT. Wayne started working with the tower industry in 1994 and attended his first NATE event in 2006. I like the way he summed it up when I asked what he enjoys about working in the sector. “The tower industry is always looking for solutions that offer them efficiency, safety and reliability,” he replied. I could certainly relate, as a supplier of equipment that does just that. As Wayne added in networking conversations, Straightpoint offers a solution that is very quick and accurate. It was music to the ears of a captivated audience. Wayne Wille, technical sales manager, talks a NATE visitor through the COLT. Even as the business leader, I was there to learn from Wayne and the contacts he has spent many years cultivating. It would have been a mistake to be bullish on my first visit to the show. As I listened to stories, I was charmed by references to the mechanical dynamometers with cable grips and come-a-longs that were widely used in the sector years ago. They spoke about juggling three pieces of equipment; with COLT they’ll use just one. I’m singling Wayne out but it’s worth referencing the expertise Dave Mullard, our UK-based business development manager, has in this marketplace. The engineering and marketing teams deserve a doff of the cap too for producing a product that looks fantastic but is also designed for purpose. Many tower erectors identified its key components and standout features just by looking at the COLT’s dimensions, which was rewarding. Despite this positivity—“The COLT will sell very well in this market,” Wayne beamed within the first hour of the NATE show—we haven’t put all our eggs in one basket. Manufacturers of any product will be wise to challenge its potential for diversity even when the fanfare from the primary marketplace is prolonged. We’re already looking at applications including cable median barriers, zip lines, metro transit, ski lifts, fall arrest systems, and more. The first units will be put to use on site as early as 1st May this year! 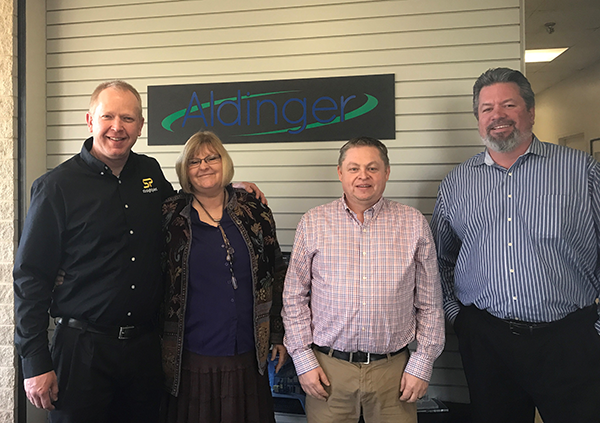 Wayne Wille and I used our trip to NATE’s conference to visit Aldinger, an accredited calibration, certification and repair center for test and measurement instrumentation. It was truly an honour to spend a few days among tower erection professionals, most notably because of their positive outlook. Positivity is damn powerful; don’t underestimate it. I spend a lot of time at lifting equipment, oil and gas, maritime, breakbulk and other trade shows where, with all due respect to these industries, there is often an air of negativity about the state of the market and prospects for each other’s businesses. Not so at NATE. These guys are on the up, in more ways than one. Meanwhile, Jeff Miller, the new general manager of Straightpoint Inc., has settled into the company and has started to focus on our six key performance indicators for 2017. The old adage is true, if you can’t measure it, you can’t manage it. (There’s a nice synergy there with our equipment!) Jeff’s introduction to the company has allowed John Molidor, director of sales for the western hemisphere, to concentrate on big projects, research niche markets and attend trade shows. 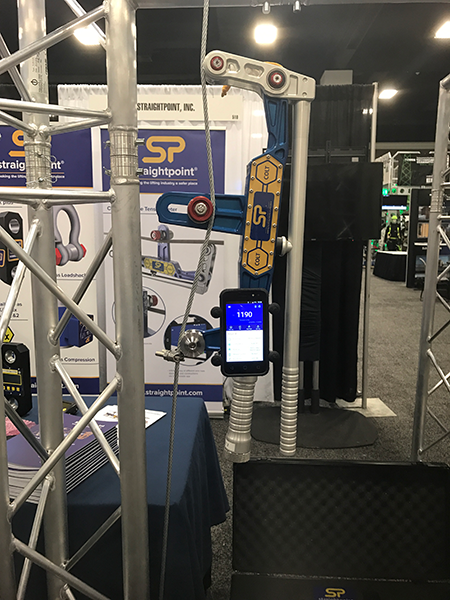 He was at ConExpo-Con/Agg in Las Vegas this week where he caught up with many contacts to discuss force measurement, load monitoring and suspended weighing load cell solutions for the construction sector. There have been other highlights over the last month or so but, as always, I can’t cover them all in detail. 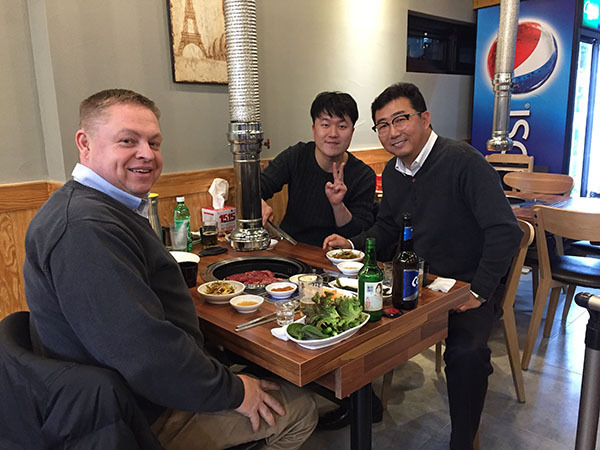 Joining Scott Abernethy on a traditional English pub-crawl during his recent visit from Straightpoint Inc. in California and an enlightening trip to Gaylin in South Korea were among the most memorable moments. 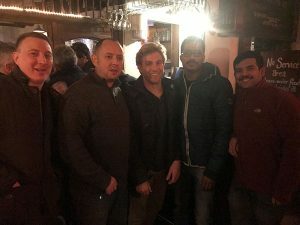 Scott Abernethy (centre) enjoyed a pub-crawl during his recent visit from the USA. Thank you for reading! Use the hashtag #loadcell on social media.